Only last year, CosmoQuest was referred to as an Ex-NASA Citizen Science Project – but now that’s not true anymore because the NASA funding has returned to the tune of $11.5 Million over the next five years, as project director Pamela Gay has recently revealed during an recording of Astronomy Cast. We already knew since last September that CosmoQuest had won the NASA grant, but only now the full details are slowly beginning to emerge. There is no official press release from CosmoQuest yet – I’ve heard that is still being worked on – but the overall funding amount of $11.5 Million is much, much more than I had originally estimated back in October based on the number of organisations that got the grants. So this is very good news and will allow CosmoQuest to go back to doing proper science instead of barely surviving on a donations-funded shoestring budget and having to worry about funding all the time. Update: shortly after I published this post, a new article with a job offer was posted on the CosmoQuest blog. 2016 will be an awesome year for CosmoQuest and citizen science in general – it finally looks like the sad times of sequestration and underfunded science education and public outreach are finally coming to an end. And for anyone who doesn’t know what they stumbled into here, I recommend this article about the Origins of CosmoQuest on the project’s own website that explains everything! Recently, I noticed that the different font rendering under Windows 7 broke the layout of the top menu on this blog a little bit – this never bothered me because I had no other operating systems than Windows XP on my computers before I got my new laptop! But because the layout was also a bit wonky under Android, I have fixed this now and also slightly overhauled the top menu. To make room for a long needed Science button, I made the plunge and changed the site logo to BIBRA.EU. This domain has been active for a while and already redirects to the blog, but next year I will move the whole site to the new address. Otherwise, everything is going to remain the same here for the time being, meaning that it’s still going to be my all-purpose blog for everything that does not fit into my other sites. There’s also something else going on… I completely forgot to mention it here because I was so busy, but I have been building a new website for the WSH Crew Google+ Community this Summer! This means that the old Hangout Schedule Index which I had been maintaining here on the blog is now a part of the new website, but apart from some major layout improvements it is still the same page administrated by yours truly in cooperation with the other WSH Crew admins Nancy Graziano, Hugo Burnham, Silvan Wespi and Jim Meeker. The WSH Crew Community is also the reason I don’t write as much about science and astronomy here on this site at the moment, since we are posting all the interesting news over there, but I will probably still write the occasional article now and then. For everything else, go and join the WSH Crew Community – it’s a nice and cozy place and in addition to lots of space news we always keep everyone updated about which hangouts are happening. So the changes here are actually not very earth-shattering, but at least I got around to work on the site a little bit. Maybe there will be more improvements along the way sometime! This year’s CosmoQuest Hangoutathon did not only result in astounding, record-breaking donations of over $36000, but also in more than 36 hours of video. Like in the last two years, I went through the recorded Youtube videos again and prepared video links to each segment. So here is the annotated CosmoQuest 2015 Hangoutathon – 36+ hours of science, astronomy and much more! Go Map a World with CosmoQuest! 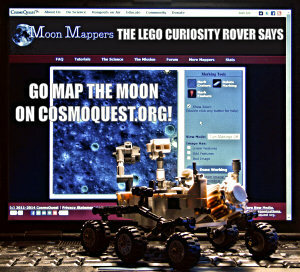 The Lego Curiosity Rover says – go map the Moon on CosmoQuest.org! Or you can go planet mapping on Mercury or asteroid mapping on Vesta – and soon you can continue on a world solely inhabited by robots! This is a post I originally wrote last year, but with another CosmoQuest Hangoutathon coming this weekend, it’s time for a repost in a slightly updated version. The mapping projects have always been a cornerstone of the citizen science projects of CosmoQuest, allowing everybody to contribute to science in an easy, instantly understandable way. Crowdsourcing the identification of craters and other unusual landmarks on the Moon, Mercury and Vesta is as easy as drawing a circle on the screen, but helps the scientific understanding of these surfaces. And the success is there – in March 2014, the Moon Mappers study was accepted in Icarus, a major peer-reviewed scientific journal, showing that crater identification by citizen scientists is practically as good as if experts were doing it. Three years after the beginning of CosmoQuest, the idea of creating a virtual research lab has been scientifically proven to be extremely useful. But what does this really mean for the participating non-scientist? In preparation for last year’s hangoutathon fundraiser, a new series of articles headlined Your Science Results Explained were giving the answers to this question, because the original paper is admittedly not so easy to understand for non-scientists. But leave it to CosmoQuest to boil the publication down to a more easy level, because this is what they do best: making science accessible for everyone! To get started with the Moon-, Mercury- or Vesta-Mapping, all you need is to register for free on CosmoQuest.org – this login also works for their Forum as well – and start circling craters and marking other unusual features on the Mappers websites. You will be shown an introductory video guide the first time you log in so you will know what to do, but all in all it’s fairly easy and fascinating as well, because you get to explore the surfaces in great detail and often see images nobody has ever closely looked at before. The mappers websites not only work on the desktop PC, but also on tablets snd even smartphones. Drawing the circles on the tablet is a bit tricky especially on small display sizes, but even on 7″ devices it works well especially if you can use a stylus. The website has also been completely overhauled in 2014 and now works much better across devices and screens of all sorts. And regarding donations, of course you can always give to CosmoQuest, but if you can’t, at least spread the word and support them by doing a little public outreach. And watch the Hangoutathon this weekend, it will be amazing! The CosmoQuest 2015 Hangoutathon is coming! Note: please see the main Hangoutathon page and the second blog post for current information! It’s been more than two years since the sequestration and the following loss of a NASA education and public outreach grant has hit the citizen science project CosmoQuest, but with the help of donations it has been able to survive and even expand and improve. While there have been two relatively successful fundraisers in 2013 and 2014 dubbed Hangoutathons after the Google Hangouts platform, the donations only go so far before they run out. There may be a new NASA grant on the horizon for CosmoQuest later this year, but until then the project still needs support and that’s why a third 36-hour Hangoutathon is going to happen at the end of April in less than two weeks. So what happens on a Hangoutathon exactly? For that you can go to the index pages of the 2013 and 2014 Hangoutathons to find out – the full recordings of both events are on Youtube and while it’s really a bit too much to watch everything in one go, this is a treasure trove of science, astronomy and fun of all kinds. A full schedule of the 2015 Hangoutathon will probably be available soon and this year it’s going to be even more exciting because amongst a lot of other things CosmoQuest is partnering up with Astronomers without Borders and the Global Star Parties of the Global Astronomy Month! There will be at least a second post, if not some others about the Hangoutathon and CosmoQuest before the end of next week, so stay tuned! Well, that was fast. It feels like Christmas was just last week and now suddenly it’s Easter again – how did that happen? It doesn’t help much that Easter is very early this year and the weather has been less like early spring and more like late winter, so it really doesn’t feel like the season with the eggs and the bunnies! But at least it’s not as bad as 2013 when we actually had snow on Good Friday. I hope everyone’s having a nice Easter holiday weekend – this year, I don’t have much of a program except some recycled content and some pretty pictures, but I’d still I’d like to wish everyone a nice Easter holiday! This post is just a little roundup of what I’ve been doing lately on the web – so what has everybody else been up to? For the first post of 2015, here’s a reminder that I’m still regularly updating the Science & Astronomy Hangouts Schedule in collaboration with the WSH Crew Google+ Community. I have now migrated the original blog post from August onto its own page, but all the old adresses still work and just redirect to the newly improved version, which will always be updated like before in tandem with the WSH Crew Google Calendar. The new edition also has more links to Google+ pages, websites, Youtube channels and video playlists to gather all the hangouts together especially for visitors who might be unfamiliar with them and want to have a look around. You can also join us the WSH Crew Google+ Community (named for the Weekly Space Hangout) which has been growing a lot since we created it earlier last year – if you’re interested what’s new in space and astronomy you might feel right at home there. It’s much smaller than the big Space Community on Google+ and relatively low-noise, but filled with a great group of people who have been following and supporting what CosmoQuest, Universe Today & Co are doing. Some of the journalists and scientists involved in the Weekly Space Hangout have also joined and hangout organizer and host Fraser Cain has asked the community to contribute news stories to the hangout by posting them in the news section. This has been very successful in the last couple of hangouts, making them even more lively than usual in the last half. So you can join in and be a part of it if you want!